Life takes its turns and for quite some time my kites were stuffed away in the basement. My website was also put on hold and not updated anymore. Recently my life took a new turn making an opportunity to dig out the kites and play around on the 'net once again. My website - AERIALIS Kites - is not going to be like the old one, but more like a blog-thing with updates every now and then. 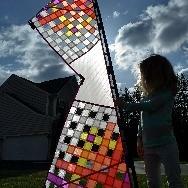 Please drop by - http://kites.aerialis.no/ - and have a look! My kites have left the cardboard boxes and found a place in the kitebags again. Ready to haul the to-go bag and go to a local field (much) more frequent than the for thelast years. Well, that's plan A anyway. So... See you around, on a field or on the internet. Hi, and welcome to the forum. It's good to have you on board and back into kiting. Dig your website!! Great pics and video! Welcome back brother Sven, I hope to see you again in September. Yeah, those were the days! BTW I'm currently re-publishing quite a few of the old articles on the new website. Hope you like them!